Pumps are the workhorse of the plumbing industry. Get the one with GPM, head range, voltage, and horsepower capabilities that are ideal for the job here. 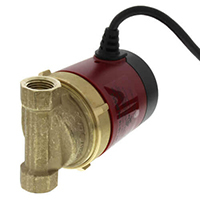 Pumps (circulators) are used in hydronic systems to move water through the system at a desired rate. 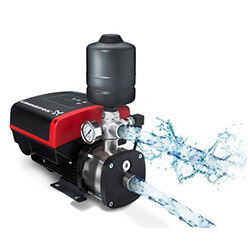 There are many important factors to consider when purchasing a pump, such as GPM, head range, voltage, and horsepower. GPM (gallons per minute) is a measure that indicates the maximum flow rate of water a pump can circulate at a given head range. Head range is the number of feet a pump can raise or lower a column of water at atmospheric pressure. 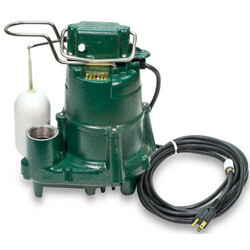 Sump Pumps Sump pumps are used to remove excess water from a sump pit. 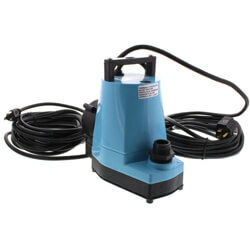 The most common place to use a sump pump is in a basement prone to flooding. 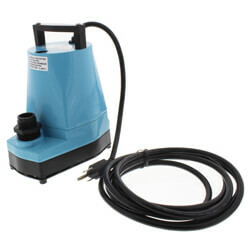 Sump pumps are available in two varieties: submersible or pedestal. 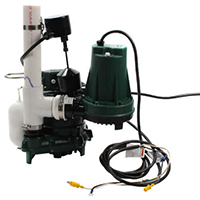 A submersible sump pump operates while submerged under water, while a pedestal pump is hoisted on a support and switches on only when water reaches a certain level. Sewage Pumps A sewage pump moves solids and liquids between locations. 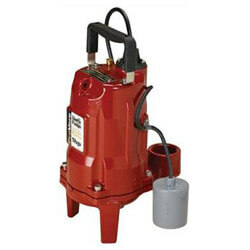 A typical sewage pump will sit in a sewage basin, which must be in the lowest area of the location in need of drainage. A sewage pump may also be submerged. 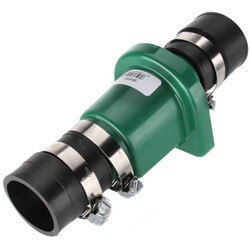 Effluent Pumps Effluent pumps are used in sanitary sump drainage applications to transfer wastewater. Effluent is the gray wastewater that remains after the solids settle out. 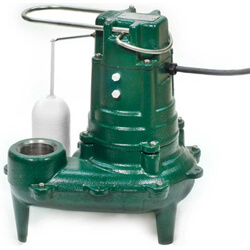 These types of pumps are commonly found in septic tanks. 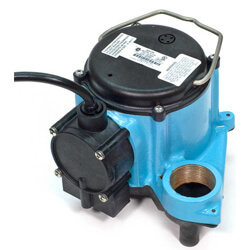 Recirculator Pumps Recirculation pumps provide hot water every time the tap is turned on. This saves water, energy, and money. A recirculation pump takes cool water that goes down a drain and recirculates it back to the water heater through the cold water line. 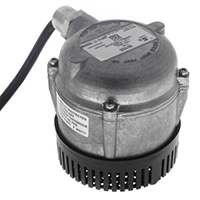 Pool Pumps Pool pumps are available in two varieties: cover pumps and utility pumps. A cover pump removes water that rests on a pool cover. A utility pump is submerged on a flat surface to pump clear water. 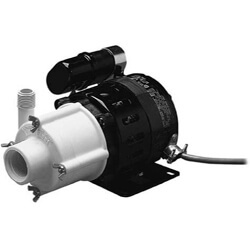 Pool pumps are generally used for dewatering and filling. Grinder Pumps A grinder pump is a device used to manage waste. Wastewater from household appliances (toilets, bathtubs, washing machines, etc.) 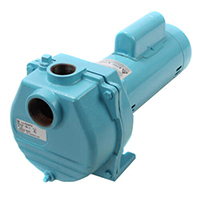 flow through the home's pipes into the grinder pump's holding tank. Once the waste inside the tank reaches a specific level, the pump will turn on, grind the waste into fine slurry, and pump it to the central sewer system. 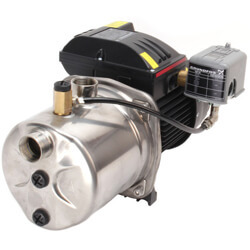 Grinder pumps can be installed in the basement or in the yard. Well Pumps A well pump is a pump that uses suction and pressure to produce something from a well, usually a liquid substance. The most common for the home isl be a water well pump. Well pumps come in various sizes. Residential well pumps may have less than one horsepower of energy in order to produce water. However, a commercial well pump often will contribute, along with other pumps, to supplying water for the entire community. Therefore, much more power will be needed. Irrigation Pumps An irrigation pump is a pump used for providing water to a section of land. An irrigation pump can be powered by a couple of different sources. Most are powered by electricity. Some may be powered by other fuel sources. Electricity offers the convenience of a constant energy source as long as the service is available. 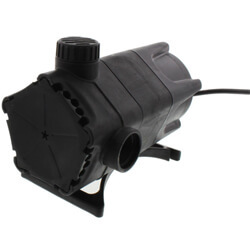 Pond & Waterfall Pumps Pond Pumps are re-circulating and most often Submersible Pumps that power Waterfalls, Water Fountains and Pond Filters in Garden Ponds. These types of pump have to be designed for continuous duty. Energy efficiency and durability are very important because Pond Pumps have to run continuously for many months. Utility Pumps A utility pump (also called a drainer pump) is a small portable electric device designed to automatically drain an area of unwanted water. It is typically not permanently installed and is plumbed so that its discharge is directed away from the drained area. Moving water quickly and efficiently from place to place is what utility pumps are specifically designed for. We offer a wide selection of Little Giant, Grundfos, Zoeller, Liberty Pumps, Taco, and Bell & Gossett Pumps to suit all of your plumbing needs.